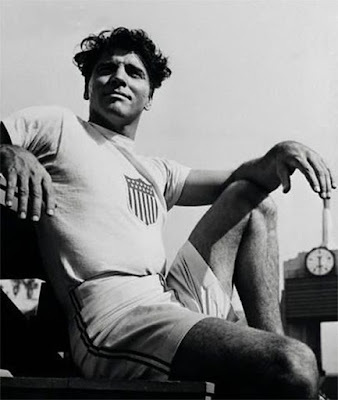 Today, I'm reviewing the biopic, Jim Thorpe -- All-American (1951), starring Burt Lancaster. This article is part of the Athletes in Film Blogathon hosted by Once Upon a Screen and Wide Screen World. Today, many people might not be familiar with the name Jim Thorpe, but during his lifetime this Oklahoman was known as a "the world's greatest athlete" for his exceptional abilities in track and field, baseball, basketball and football. Thorpe, who was an American Indian from the Sac and Fox Nation, is the subject of an excellent 1951 biopic that both honors his skills on the field and takes a hard look at the prejudices he faced off the field. 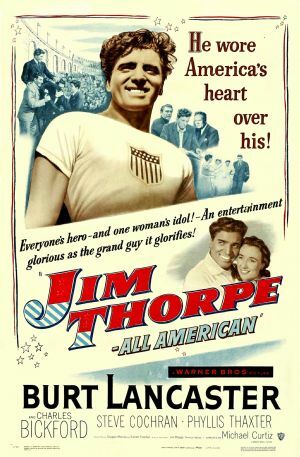 Jim Thorpe -- All-American (1951) begins when young Jim (played by Billy Gray as a child and Burt Lancaster as an adult) is a rambunctious boy living on an Indian reservation. Jim, who can easily run 12 miles at a time, dislikes school, but his father (Nestor Paiva) worries that he will not be able to survive unless he receives an education. Jim is then sent to the prestigious Carlisle Indian School in Pennsylvania where he is mentored by coaching legend Glenn "Pop" Warner (Charles Bickford), who guides Jim through a legendary college football career and at the 1912 Olympic Games in Stockholm where he wins gold medals in the pentathlon and decathlon. However, after a series of personal blows, including being stripped of his medals over a technicality, Jim begins to lose his athletic prowess and drink heavily. A biopic about Thorpe had been talked about in Hollywood for decades, but no one got around to actually making a movie until Warner Bros. won a bidding war for the rights to Thorpe's unpublished autobiography. Although Thorpe hadn't played professional sports for decades, he was still a well-known name in popular culture, and the studio hired an A-list cast, and assigned the project to veteran director Michael Curtiz, who helmed many a Warner's blockbuster. Jim Thorpe during his time as a professional football player with the Canton Bulldogs. The result is an immaculately photographed movie (the great cinematographer Ernest Haller was the director of photography) that provides a sympathetic portrait of Thorpe's troubled life. At first glance, Lancaster seems miscast in this role -- the attempts to make him look like Thorpe fail miserably -- but he makes up for it with his natural athletic prowess and intuitive acting. Lancaster was a circus acrobat before becoming an actor, and he is certainly the only A-list star of the early 1950's who could have come close to replicating Thorpe's feats for the camera. However, Lancaster goes beyond mere physical skill to give a moving portrait of a man who has been wounded by both the prejudices within American society and by his own weaknesses. Jim Thorpe -- All-American is exceptional among old Hollywood films in dealing with Native Americans in modern American society. Many Westerns portray Indians as one-dimensional villains, although in a few films -- Broken Arrow (1950) is a good example of a film made in the same time period -- there are sympathetic portraits of native life and culture. 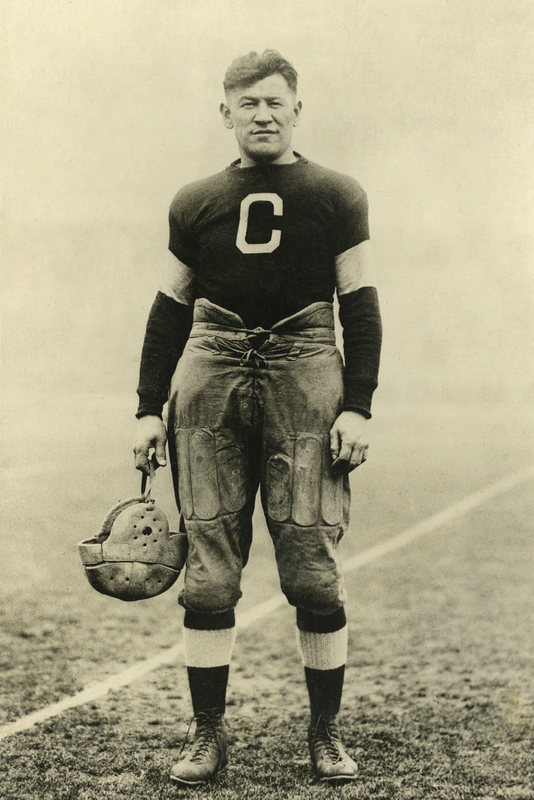 Although Jim Thorpe -- All-American throws in a few tepees and feather bonnets, it largely shows Native American people as fully functioning members of society who are lawyers, nurses, and, in Thorpe's case, gridiron heroes. 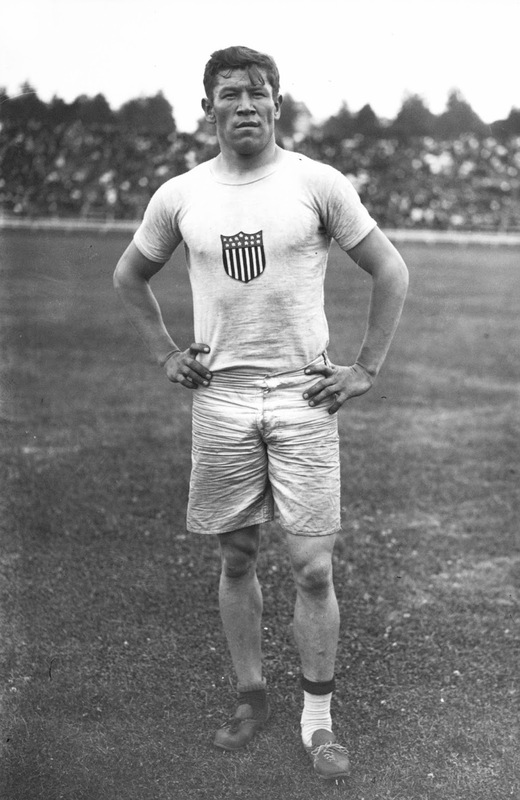 Jim Thorpe at the 1912 Olympic Games. Jim Thorpe -- All-American was a big hit in its day, and Warner's and Lancaster made a concerted effort to get the International Olympic Committee to restore Thorpe's medals. The IOC stripped Thorpe of his medals because of a minor technicality: Olympic athletes weren't allowed to be paid for playing sports, and Thorpe had played minor-league baseball for a short period of time, although he only received a paltry $2 per game. Sadly, the organization refused Warner's requests, and Thorpe died in 1953. It wasn't until 1982 that the IOC reversed its decision and restored Thorpe's medals to his family. Lancaster expressed mixed emotions about the decision in an interview quoted on the TCM database. "I felt a certain cynicism that he didn't get them before," Lancaster said. "What does it mean now? There is a feeling of bitterness that it didn't get done in his own time." Despite the prejudice that Thorpe faced, his accomplishments have never been equaled in the world of sports. I'll leave you with this video of vintage clips from Thorpe's time at the Olympics. Jim Thorpe -- All-American is available on DVD and video on demand. My father told me about Thorpe as a kid and I remember learning about him from shows like WIDE WORLD OF SPORTS. I didn't know there was a movie about him but I'm not surprised. My dad talked about him too. He used to play football for the Canton Bulldogs which is near where I live. Curtiz did not know how to make a boring movie and with this story to tell Warners came up with a winner. Your comments on Lancaster's performance ring so true. I haven't seen the movie in almost 25 years, yet I still feel that emotional connection to Jim Thorpe. The politics that plague the Olympics really take the sheen off an event that should be so uplifting. Fun fact I forgot to put in the article was that Curtiz was a member of the 1912 Hungarian fencing team. Now we know why the sword fights in his movies were so well done. Agreed – at first Lancaster seems like the wrong choice for Thorpe, but his natural athleticism gives him credibility. Thanks for including the info about the IOC finally giving the medals to Thorpe's family in the early 1980s. Glad to see they did so, but like Lancaster said, what good does it do now? Great post and excellent choice for the blogathon! Lancaster was always a class act and he continued to advocate for Thorpe through the years. The first time I saw this film I was about 8 or 9 years old. Two scenes that I remember well is when Thorpe is penalized by his team manager for hitting a home run because he ignored the signal to bunt. The second is when Thorpe is exhorted to recognize Vice President Charles Curtis as a successful role model for Native Americans... Ouch!... Unfortunately, as I learned more about Curtis and his conviction that Native Americans should completely forget their heritage and fully assimilate in the dominant American culture, the more that climatic scene sounds like a clunker. As I have gotten older it seems that as a general rule, Vice Presidents have never made a successful role model. Nobody ever dreams of becoming the Veep.